Invention and concept development: U.S. PATENT NO. 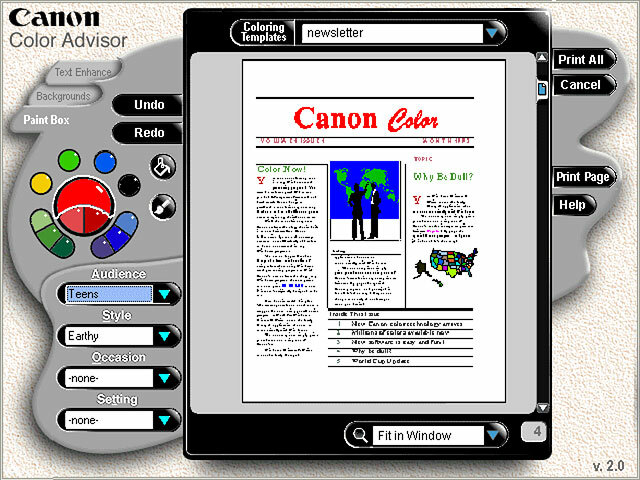 5,615,320, “Computer-Aided Color Selection and Colorizing System Using Objective-Based Coloring Criteria”, March 25,1997. Created and developed UI layouts, splash screen and program icons. Created and developed algorithms for color palette creation based on objective criteria. Production of functional specifications and other documents for engeneering implememtations. Look and feel developed in conjunction with GVO.